This is a 7-week, 5 days/week kettlebell-based cycle with a strength emphasis. The plan also trains work capacity, chassis integrity, and endurance, but it’s emphasis is on strength. 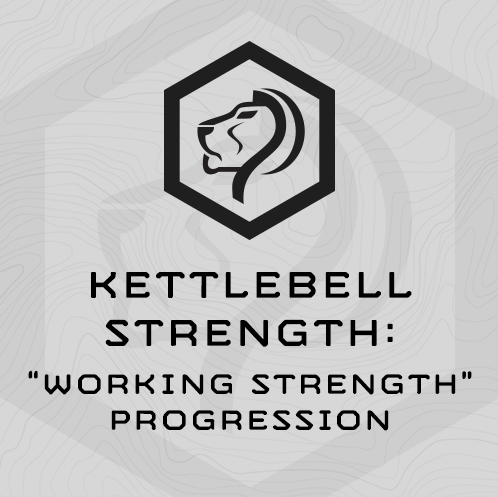 This cycle deploys kettlebell-only strength training using a “working strength” progression. In general, instead of keeping the volume the same (sets x reps), in this cycle we aim to keep the load the same, and increase the volume. For example, one week you might finish 4 Rounds of 4 reps of 2-Handed Kettlebell Clean + Strict Press at 24kg, and then the next week I’ll ask you to use the same load and finish 4 Rounds of 5 reps each set. Also – most of the strength circuits in this cycle don’t include a stretch or mobility drill like you may be used to with MTI Programming. For most strength circuits, we pair the prescribed kettlebell strength exercise with a pull up variation, and ask you to work “steadily” through the circuit. Don’t over think “steadily” – it’s okay to pause for a rest (you’ll need to!) or get a drink, just don’t try to take 5 minutes between sets, or work frantically through the circuit like it’s a crossfit WOD. This cycle’s work capacity efforts are all short, hard, 10 minute efforts – 2 of 3 are shuttle sprint-based, and the 3rd is bodyweight based. You’ll complete a 15 minute ART Circuits (Anti-Rotation, Rotation and Total Core exercise) 1x per times per week. This cycle deploys a 3-mile Run for time assessment and follow-on 1-mile intervals. You’ll run 3 miles for time three times during this cycle – beginning, middle and end. Full set of kettlebells. Many of the exercises are 2-handed, so you’ll need pairs. How do I access the plan? Pdf? Online? App? You can access the plan through our website or app (Mtn Tactical Fitness), both via username and password. "Grind" Through these circuits. Unlike many of our strength circuits, most of these today don't include "working rest" in the form of a stretch or mobility drill. Work steadily, but not frantically. Most important is to get up heavier weight. Working steadily and with purpose, you should be able to finish this training session in 60-65 minutes.